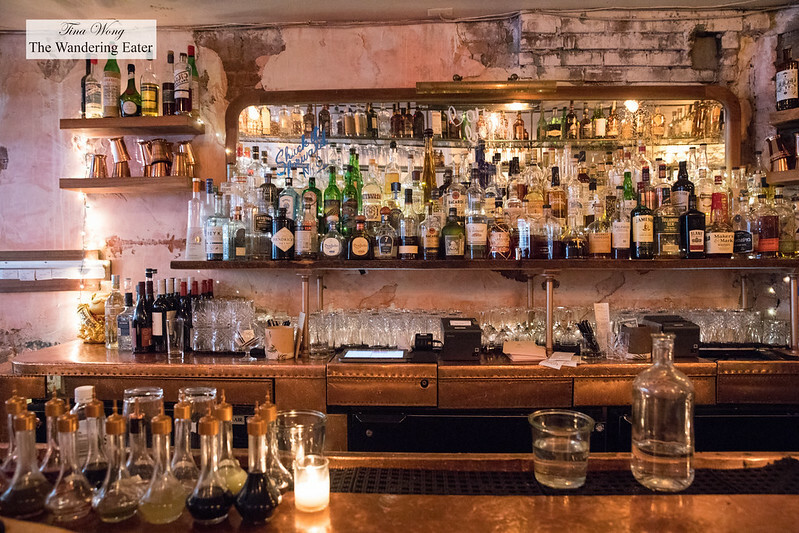 In the neighborhood of Lower East Side, it’s filled with bars that can range from dive to upscale. 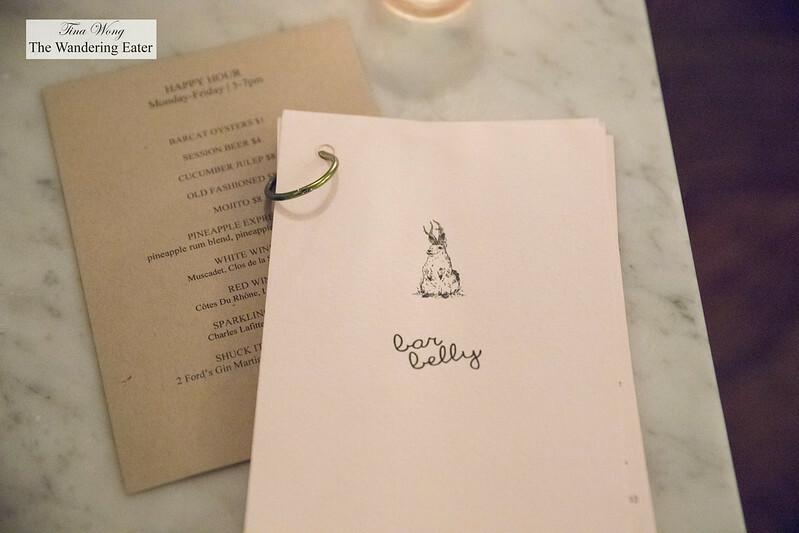 Bar Belly is a great cocktail bar, oyster bar, and have a band performing (at least when a friend and I were there on a Thursday night). The bar itself is a long and narrow, set with a beautiful bar up in the front with mid-century Europe-and-Americana-inflected design with its jackalope mascot mounted toward the middle of the room. Bar Belly has a very good happy hour menu, along with a solid selection of wine and beer. However, we are here for the cocktails. My friend who was a little too excited and sipped his cocktails before I was able to photograph them. The Simple Rick made of High West Silver Oats whiskey, Cocchi di Torino, wild cacao butter infused Campari is a slightly sweet take on a Manhattan but a solid drink and a balanced, citrus-y Old Fashioned was very good. I went into two different directions in terms of styles and flavors. 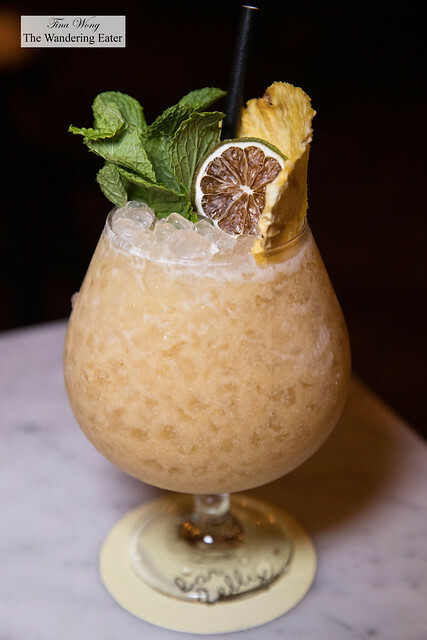 The Wonder Woman is a beautiful, large tropical inspired drink. 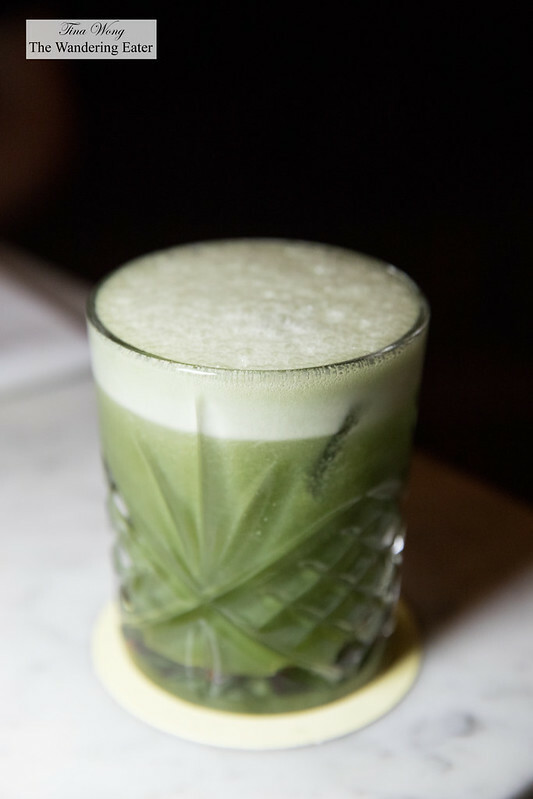 Made of Yagara cachaça, Don Q Añejo rum, allspice dram, curaçao, lime juice, and pandan passion cordial it feels appropriate since it’s a warm evening. 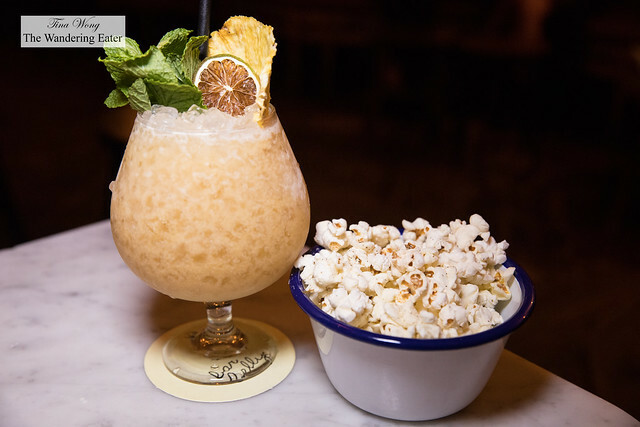 It’s on the sweeter end given it’s made with cachaça and aged rum but it’s sweet, easy to drink and fruity. 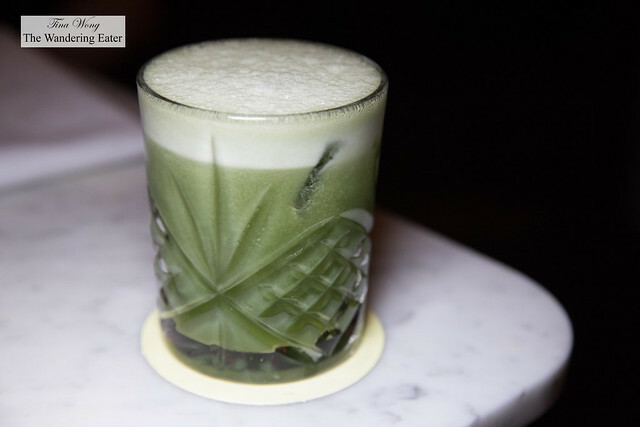 The other drink was the I Like to Matcha made of Barstol pisco, Don Q Añejo rum, pineapple syrup, matcha chamomile syrup, lime juice, chocolate bitters, and tonka beans tincture. When sipping the matcha cocktail, it surprised me how fruity and a touch sweet it tasted rather than the bitter, grassy flavors I’m familiar with when I drink matcha (ceremonial style). 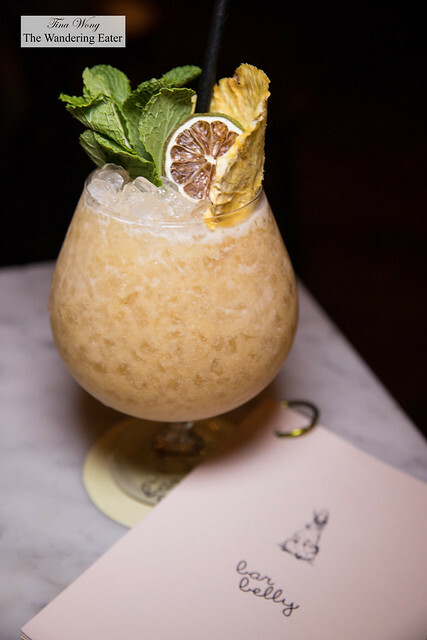 It’s a light and refreshing drink that even appeals to my bourbon and whisky loving friend. 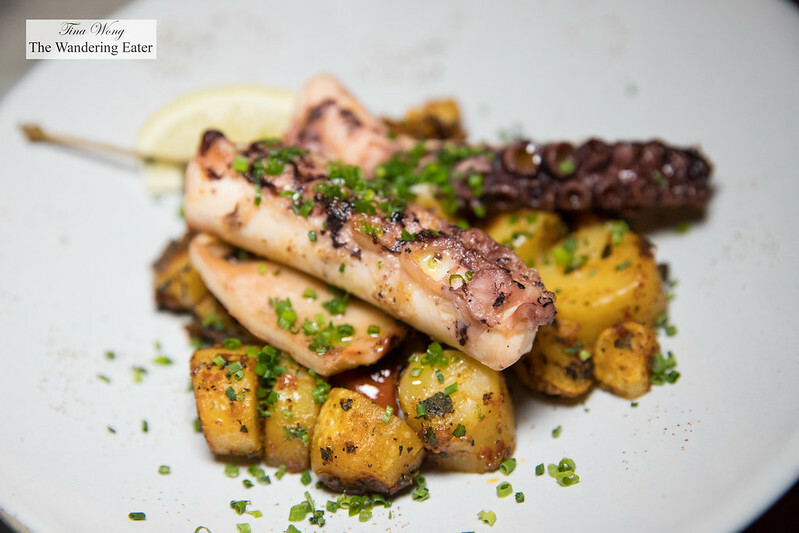 The food menu offers oysters from both coasts (which you can get for a dollar during happy hour), and half a dozen or so well-curated small plates. 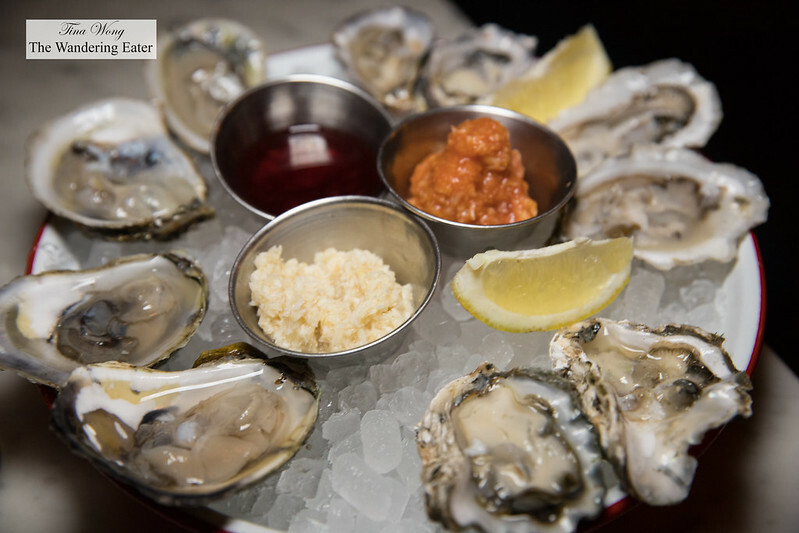 The oyster bar had five varieties of oysters representing both West and East Coasts that evening and they even have the popular (and my personal favorite of the moment) sweet kumamoto oyster. They also have the briny Wellfleet, a mild and smooth Martha’s Vineyard, Blue Point, and another oyster that’s escaping my memory. They were all very delicious and great to eat with the cocktails. 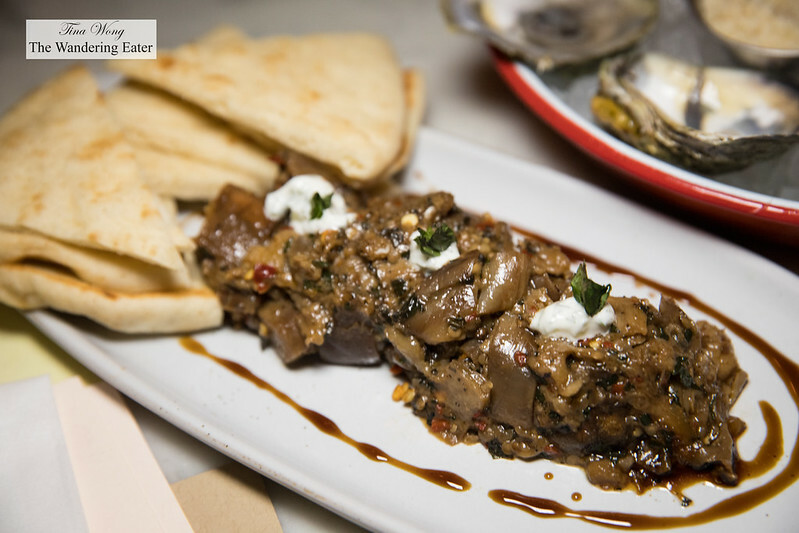 As for cooked fare, the spicy eggplant with pita bread was creamy, complex enough with the chili spice and tangy yogurt and sweet pomegranate molasses. The Portuguese octopus was tender and flavorful with the harissa and briny caper berries and tomato sauce and the potatoes added some substance to the dish (and helps absorbing the alcohol). 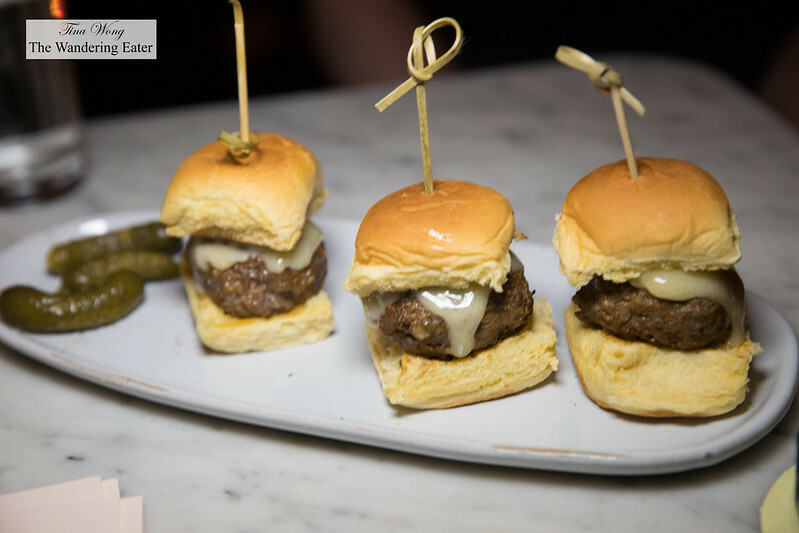 The trio of lamb sliders topped with gruyere cheese and tzatziki set in soft, squishy potato buns. The sliders were juicy and well seasoned and very tasty. We had a good time there. The jazz inspired interludes from the live band that plays for ten minutes or so at the top of every hour was good and the familiar pop songs of yore that played in between were danceable, if there’s room to dance. 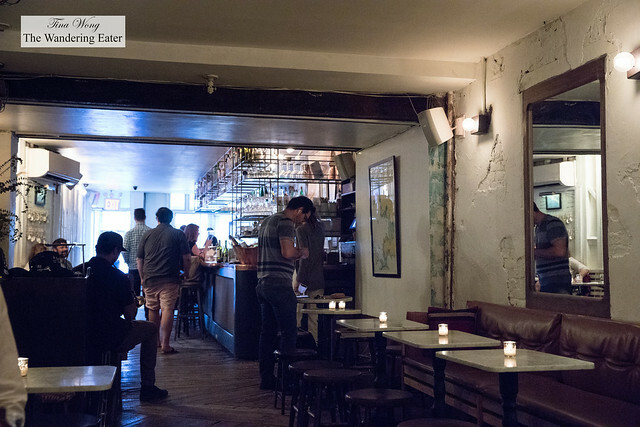 The relaxed atmosphere is great for dates or hanging out with friends. The drinks and food are definitely solid. 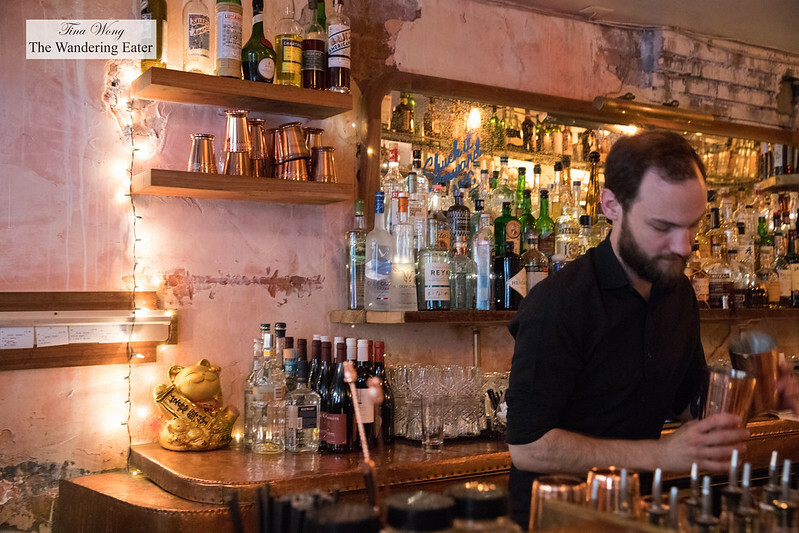 The wait staff and bartenders are friendly and are happy to suggest drinks that work with what you like.